Code orange weather alert is in effect for 5 districts of Bulgaria for 10th of January. 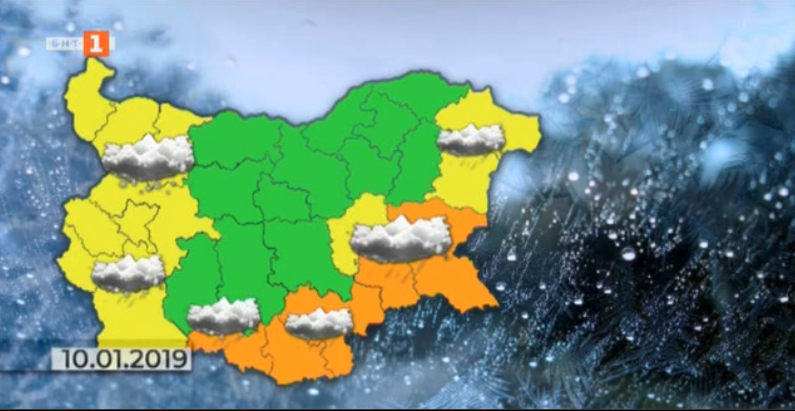 Road traffic situation is complicated due to heavy snowfall in West and South Bulgaria. Roads are being cleared and sanded. Traffic is temporarily restricted at the time of snow ploughing. Vehicles are required to use chains, especially in the region of the Rhodope Mountains (South Bulgaria). Shipka pass and the Pass of the Republic are passable in winter conditions. There is a power outage in a village in Kardzhali, South Bulgaria, due to the heavy snowfall. More than 160 snow ploughing machines are operating in the capital city of Sofia. Companies servicing the region of Vazrazhdane in Sofia will be fined, because they did not clean the snow from the public transport stops in the morning.